Citizens today are demanding more accountability from their government. They want to see how their tax dollars are spent. They want to put a stop to waste and bloated bureaucracies. And they want their civil servants to be like the clerk at the convenience store around the corner – ready to serve them what they need, when they need it. Or better yet, they’d like to access those services from the comfort of home or work via the web or on the go with their mobile devices. With open data all of that – and more – is possible. Open data is about transparency, about giving citizens access to the data their tax dollars help create and it’s about innovation – enabling software developers to transform that data into useful applications that make city services available anytime, anywhere. The good news for cities just beginning the open data conversation is that today a full arsenal of lessons learned and best practices from cities that blazed the open data trail is available. So there’s no need to start from scratch and make the same mistakes they did – and every opportunity to borrow from their successes. 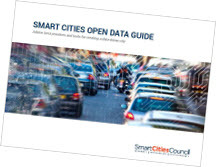 The Council's Smart Cities Open Data Guide captures those lessons learned and best practices to provide city leaders and staff a starting point to chart their own initiatives. It is not intended as a technical document, rather a primer loaded with tools, resources and advice for creating a data-driven city. If you have already registered and logged in, then simply click the file name below for an instant download.